Exercise is a basic daily need, like eating and drinking and if it isn't adequately provided, serious consequences may ensue. Your dog may begin to act extremely "hyper" and put more energy into destructive activities. For young dogs, exercising twice daily isn't just a nice thing to do, it's an absolute necessity! Remember a walk around the block is NOT exercise for most dogs. 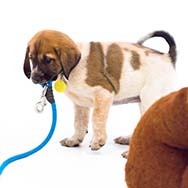 As a general rule, most adult dogs need morning and evening walks as well as 15 minutes of interactive play each day. Teach him to retrieve a ball or other favorite item. Keep him running back and forth until he tires noticeably. Tiring him out may take time, so be prepared. Introduce retrieving by using a ball or other toy when he wants to play with you. Don't play roughhouse games; instead teach him that play means re trieving. Another good running game you can use for exercise is "hide and seek." This game requires that you have a reliable recall, so work on that first. Once you've taught him to come on cue, have someone distract or hold him while you go a short distance away and hide. Call him just once, but keep praising until he finds you. Gradually make it more difficult for him, but go slowly and always make sure he "wins. You may enjoy jogging with your dog but remember to gradually increase the mileage. Never overwork an unconditioned dog. Dogs, like humans, need to begin an exercise program slowly. Don't forget that safety is as important to you companion's health as exercise, thus keep your dog on a leash while walking and jogging. Watch the weather. Avoid exercising in extremely hot or cold temperatures. Never exercise your dog by tying him to a moving vehicle. Avoid running, jumping and exercising your dog on a full stomach. Exercising your dog on a full stomach can cause bloat/gastric dilation which can be life threatening. If this should occur, your companion should be seen by a veterinarian immediately.